Written by Alan Holmes, based on the screenplay by Ray Galton and Alan Simpson for the film starring Tony Hancock, The Rebel is an amusing tale of artistic expression, the perception of art and the appreciation of it. The main character is referred to only as The Rebel and we're first introduced to him as he's making his way to work on the 8.32 train to London Bridge, taking him to the offices of the United International Transatlantic Consolidated Amalgamation Ltd where he's been employed for the last 14 years as an office clerk. The Rebel, we discover, is a frustrated artist who feels his talent has for too long gone unrecognised. His vocation, he feels, is not to be a City worker but an internationally acclaimed artist. On the morning we meet him, he's not only dismissed from his job for drawing all over his accounts ledger but also given notice to leave his lodgings by his landlady who fails to appreciate the beauty of the immense stone sculpture he's created in his room that has fallen through the ceiling into the room below due to its sheer weight. 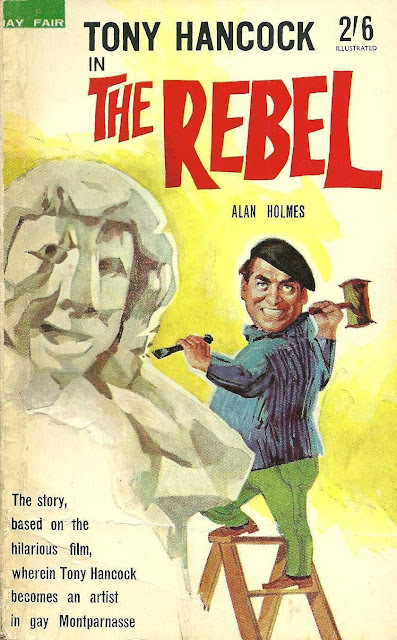 By the time The Rebel gets there, however, he has hardly any money and nowhere to live but by chance he encounters Paul, a struggling English artist who offers him a place at his studio where he can not only stay sharing half the rent but can paint in too. The Rebel, of course, is delighted. Paul, it turns out, is at the end of his tether; disillusioned at his failure in being recognised as an artist of any merit even amongst his fellow artists of the Left Bank. Being in such a low mood he is impressed by The Rebel's confidant but ultimately meaningless art babble, mistakingly perceiving it to be a totally new and unique perspective on art. Similarly, when he sees The Rebel's paintings, which are essentially childish daubings, he is susceptible to The Rebel's view of them as being a new conception of art. News of this highly original art master in town soon spreads and on meeting other artists, The Rebel's patter and self confidence wins them all over, blinding them all with his art theories without also revealing the lamentable holes in them. Disillusioned further by realising how little he knows about art and how minor his own talent is compared to The Rebel's, Paul soon packs his bags and heads back home to England leaving The Rebel's star to ascend ever higher. A renowned art dealer who has some extremely rich clients on his books pays The Rebel a visit at his studio and is flabbergasted at the art he sees there, believing he's discovered a genius. The problem, however, is that the paintings he's in awe of are actually Paul's and The Rebel's own paintings he dismisses as rubbish. This, of course, puts The Rebel in a dilemma. Always with the intention of passing the money from the sale of the paintings back to Paul, The Rebel decides there's no harm in basking in the glory for a little while though maintaining the charade without getting into precarious situations proves impossible. His hand is soon forced, and after fleeing from a jealous husband he sets off to find Paul and inform him of everything. The twist in the tale is that since leaving Paris, Paul has continued to paint but has changed his style completely and taking The Rebel as an influence is now producing art far more childish and far worse than The Rebel's ever was. When the renowned art dealer sees it, however, to the consternation of The Rebel, he declares it an absolute work of genius. The book is written (and the film played, of course) for laughs and it contains some rather good lines. At one point early on in the book, The Rebel's landlady is looking aghast upon his art: 'Well, what do you call this horrible thing?' she asks. 'That' The Rebel snaps 'is a self portrait.' 'What of?' she asks. The titles The Rebel gives to his paintings are quite inventive too: Sunset Over Suburbia Reservoir, The Chain Puller's Tibia, Exhaust Fumes on a Wet Thursday Night, Sodium Light on a Left Buttock. Though written for comedic effect, the book actually makes some interesting points, most notably the idea (from the William Blake school of thought) that it's not the recognition or the monetary gain that's important but the actual act of creativity itself. Anything that anyone does creative is worthwhile because art, as with beauty, is in the eye of the beholder. The film was released in 1961 so Albert Camus would never have seen it as he was killed in a car crash the year before but I do wonder if Jean-Paul Sartre (who is name-checked in the book) ever saw it and what he might have made of it? I guess it's just one of those things we'll never know. Funny - when you did your review of Camus, I couldn't help but think about Tony Hancock. Used to watch this film regularly with Mrs. Bear when we had it on VHS; it appealed to our sense of the ludicrousness of the art world. Some great laughs, too. 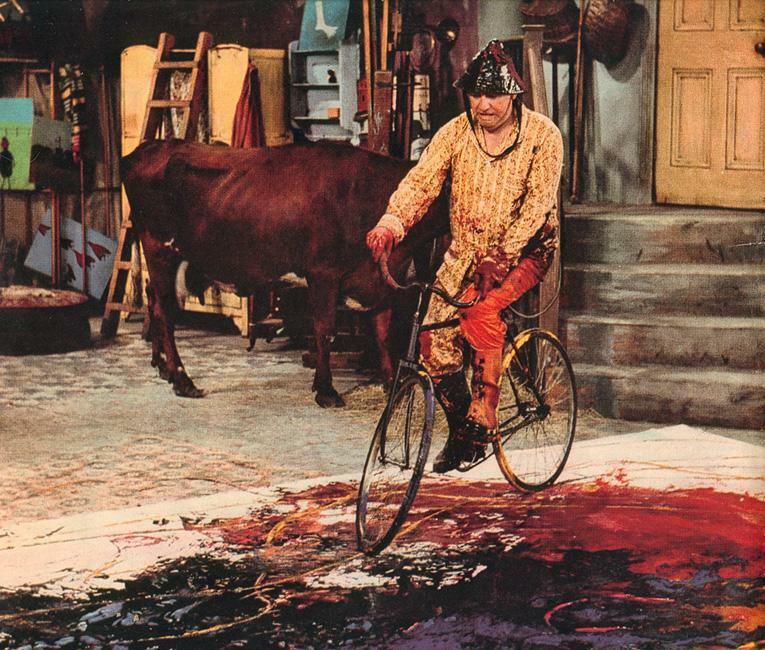 The action painting on a bike is perfect. Nice cameo from Irene Handl as the landlady.